4th Bangkok Jazz Festival at Sanam Suapa during December 15th-17th, 2006. Don't miss it. Tickets available at Thaiticketmaster. I just got back from Laos trip. There're 9 of us with 2 cars. We drove all the way from Bangkok to Luang Prabang, about 2000 kilometers round trip. (See Jesse's trip schedule here.) The toughest part of this trip was from Vang Vieng to Luang Prabang, which was slightly more than 200 km but took about 6 hours to drive. And we spent only half a day there! Should have spent another night in Luang Prabang, there're so many places to see. 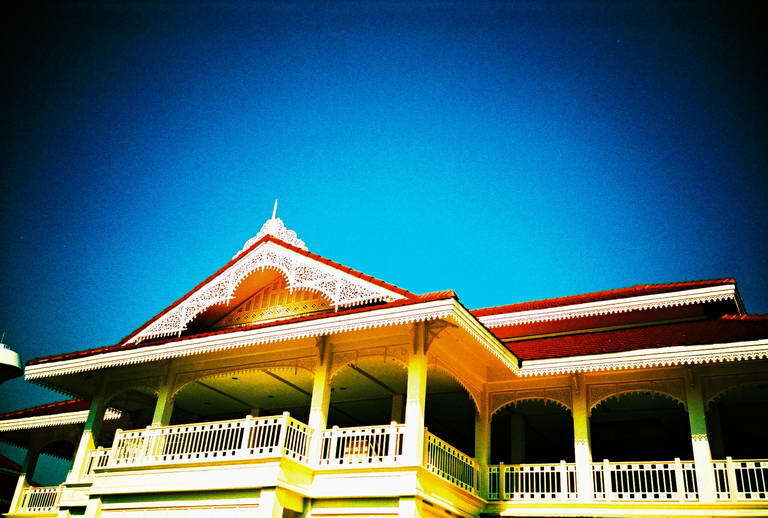 (Luang Prabang is one of the world's heritage, in case you don't know.) Another 2 nights in Vang Vieng were great. We took a kayaking tour which was fun. There're so many foreigners in both cities we visited and in Vientiane where we drove passed by. In Luang Prabang there're an older group of foreigners sightseeing cultural sites, and in Vang Vieng, a younger group chilling out with a bottle of Beer Lao in their hands. 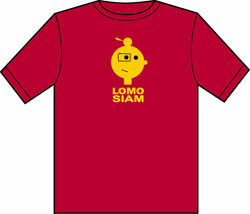 I think it's because of the nature of Lao people that makes Laos the place to relax yourself. It's like time is ticking so slowly that you don't have to rush for anything. 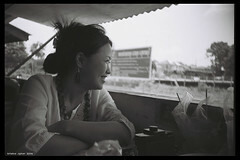 I really enjoy this trip--because Laos is a very nice place, and because I was there with great friends. 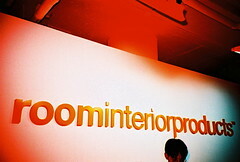 And I will definitely go there again. It's AF Nikkor 50mm f/1.8D! I don't understand why it's so hard to find one, but I had to wait for almost a month for it to arrive. Can't wait to try it out at Laos trip. It's been a long time since my last entry. This is a recap of what's happened during the past month. Annual physical exam showed lower Cholesterol level (230) than the previous year (260)--good. Garlic Pearl really helps! Got a new mobile phone, a Sony Ericsson. I now have a phone with large screen that plays music and can connect to the Internet--great. My best friend Joe got married. Wedding ceremony was held in Chainat on Nov 10th, and in Bangkok on Nov 11th. I was at both events. I'll post pictures to Flickr soon. Annual work rewards (aka bonus) was finally out. There're so many rumors about how much and when. I turned 27 last week. There's no party cause I was away for work--sad. Got my car tires replaced. They're more than 2 years old and almost 50000km. Expensive: 4000 Baht each. Beer gardens are open around Bangkok. 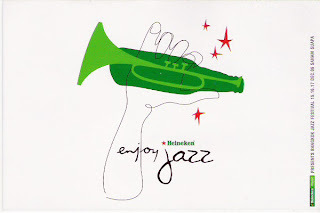 My favorite place is Heineken's at J-Avenue, Thonglor. It's not crowded, not too loud, and plays some jazz in early evening. The live band which played old Thai pop wasn't good though. Early next month I'll go on a road trip to Luang Prabang with friends. 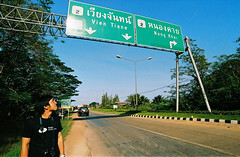 We'll drive from Bangkok to Vang Vieng through Udon Thani, Vientiane, and Luang Prabang. See our schedule (in Thai). ..in Bangkok! A total 8 shows starting Oct 10th to 15th at Thailand Cultural Center. Got to see it last night by chance--my first broadway experience. It's a good show indeed. See him sing Made in Thailand. A Carabao classic written in 1980's. 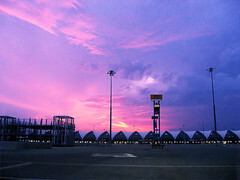 Today is the first day that Suvarnabhumi Int'l Airport fully operates. Bangkok Int'l Airport, known as Don Muang Airport, is now closed for commercial flights. The transition started shortly after midnight when last flights departed Don Muang. As a passenger, I'd known Don Muang forever, and as a pilot, I'd been flying to Don Muang for hundreds of times. Seeing it got closed down made me feel sad. It's like we had some kind of bond between us. Anyway, we have to move on cause Don Muang can no longer serve as many passengers. From Sep 15th, Thai Airways operated a few domestic flights at Suvarnabhumi, the new Bangkok Airport, in order to test the airport facilities. 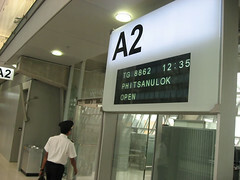 This was taken on Sep 22nd when I was about to enter boarding gate A2 for my second flight to Phitsanulok (PHS). It's finally happened. Early last night, military force moved into Bangkok. At 10pm, television feeds were cut off, all channels were broadcasting H.M. the King's videos. Then later there were announcements made by the army commander that they had seized the government house and situation was in control. Thaksin is still out of the country. Heard he flew to London. I think he knew what was going on before he left Thailand to the US. I do hope Thai politics will be better after the reform, of course without men like Thaksin. I first saw this movie's teaser a few months ago and thought it's just like a previous hit "Puen Sa Nit." I mean same plot: which one to choose; the one you love, or the one who loves you, you know, that kind of thing. Frankly it didn't catch much of my attention although I liked the characters of those kids--they looked young and innocent and that reminded me of my teenage years. Last week I just got too much free time to kill so I went to a movie with Nat (pilot friend). "Seasons Change" came up in my mind and I decided to give it a try. And it's better than I expected. It's fun and enjoyable. The director and script writer did a good job. Actors were natural. Nat agreed, although he admitted later that when it came to 2nd round, which he went with his girlfriend, it wasn't as good as the first one. Now everyone's talking about this movie. Not just how they love it, or how much they love the casts, but whether it's the first love, or the best friend that matters. Which one would you choose? Been waiting for a long time for Blogger Beta, finally I got an option to migrate to the beta. New features include labels for posts (aka tags), more flexible template handling, dynamic web page, integration with Google account, etc. Migration was quick and easy (unless you'd edited the old template to include your own codes, you wouldn't notice any changes). I'm posting this entry with the new beta. I just went to the new Bangkok airport, Suvarnabhumi Airport. There were aircraft taxi trials going on during the past few months. Participants were pilots from Thai Airways (TG), Bangkok Airways (PG), and air force (RTAF), air traffic controllers (ATC), and airport staffs (AOT). The purpose of the trial is to familiarize staffs concerned, mainly ATC and AOT, with the new procedure at this new airport, opening at the end of September. Fire department trucks (pick-ups) were used as aircrafts, and we just drove around as if we were taxiing aircrafts. The trial went OK. However, I couldn't take many pictures because it's at night. Wish I had the day trial. As I mentioned in earlier post, I just had another car accident last night! :( Well, it's only a few scratches but my car had to go to repair shop anyway. There's this watch and jewelry fair at Siam Paragon from July 27th to August 14th which features more than 100 brands from the luxury and expensive to general watches. I can't say I'm a big fan or a collector, but I really do love watches. Someone once told me that it's the only "jewelry" that a man can wear. It's true. A watch reflects its owner's taste and personality. So last weekend I went to the fair. One of the top 5 items in my wishlist is this Breitling Aerospace Avantage. It's light-weighted cause it's made of titanium. 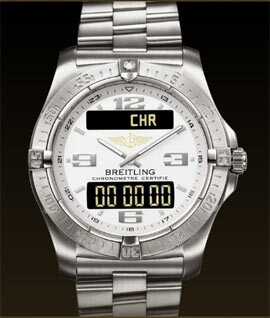 Features functions like chronograph, timer, 4 years day/date, 2nd timezone, alarm, minute repeater. Very nice. And it looked good on my wrist too. Fortunately I didn't have enough money, so maybe next time. In the past 2 weeks I ran into many troubles about my car. First I hit another car at a parking lot. Then I found one of the fog lights was cracked. Got close to running a flat tire cause I ran over a nut. As I'd mentioned in earlier entry, my training period ended yesterday when my instructor finally promoted me as a co-pilot. Yeah!! I just had a chance to shoot fireworks last Saturday at Sanam Ma Nang Lerng (Nang Lerng Horsetracks). There were actually 4 fireworks events held during the past week in order to celebrate the 60th anniversary of the king's accession to the throne. 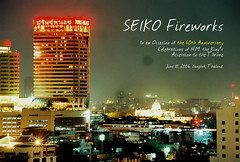 I wasn't in town the other 3 nights so the SEIKO Fireworks event was the only one I could join. The firework were from many award-winning Japanese fireworks artists. The hilight was, in my opinion, the Thai and Arabic "60" which represented the anniversary. (Unfortunately, I missed that set.) They're so large that they'd look beautiful only when looked from a distance. I was lucky enough that my mom's colleague had an apartment in Hua Lum Phong area, which was a perfect place to watch and take photos. I had never shoot fireworks before so I did some Google-ing just before I left home. It didn't sound hard at all when I read those articles: you just make a long exposure with smaller aperture. But later I realised it's harder than I thought. With real fireworks, you wouldn't know what pattern or the location or how high or how large that shot was gonna be, until it was shot which would be a bit too late. You wouldn't know how many shots there were on each set. etc. Anyway, the result came out better than I expected. Some pictures were blurry because I didn't use a shutter cord and I just couldn't hold my hand steadily. Check them out at my Flickr album. I just passed a flight exam last night. So glad I made it. If nothing else goes wrong I'll be based as a co-pilot by the end of this month. By the way, at about 8pm last night I flew over Bangkok and saw fireworks at Muang Thong Thani. View from above was very beautiful cause you'd also see a lot of flashes from cameras of people trying to take pictures. I was about to blog about a new Fisheye 2 camera a few days ago, when I decided to order it from a website abroad. Fisheye camera is one of lomography.com's products. My earlier entry features sample pictures taken with the original Fisheye. What's new with this version 2 are a flash hotshoe, multiple exposure mode, and bulb exposure. These features make it a lot better, in my opinion. And, this morning a DHL guy came with the package. I was so surprised that it took only 3 days to arrive (placed order on June 6th, got here June 9th). However, fast and reliable shipment came with price. Apart from USD 25 I'd already paid for the shipping, they just charged me another THB 626 for Thai tax and tax handling(?). 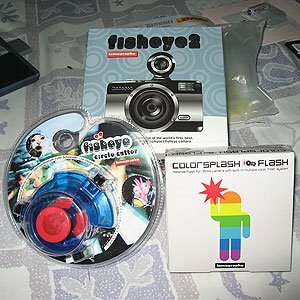 The package included 1 Fisheye 2 camera, 1 Colorsplash flash, and Fisheye Circle Cutter, all for USD 77. I used my USD50 gift coupon I got as a prize from LHTD so it came down to USD 27. S&H was USD 25, plus tax THB 626 (approx. USD 15). That means I paid more for the shipping and tax than the camera itself! Very crazy. Click photo for large version! Yesterday, while my captain and I was waiting for my plane at Phitsanulok Airport, a foreigner approached us with questions about flying private aircrafts in Thailand. He told us that he's moving from England to Thailand. And in September he'd ship his airplane, a De Havilland Tiger Moth, dated back in World War II, to Bangkok. Then he'd assemble it and fly from Bangkok to Phitsanulok. He loved flying and that plane so much that he just couldn't leave it behind. Though not very easy to fly a private aircraft in Thai airspace, but it's not too difficult to do. However, I wonder if he could get all the paperworks done. Unfortunately it was such a short conversation that I didn't have an opportunity to ask for his contact address. 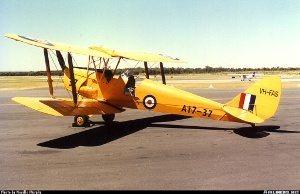 I'd love to see his Tiger Moth flying here in Thailand! I just had time to upload a few rolls of photos today. They were taken during the past week around Bangkok, Chiangmai, and in Suphanburi during a day trip on Sunday. I choose this particular picture as a sample because I really like the tone of it, makes me happy. Afterall, it's my first LOMO roll in black and white. Check out my photostream for the latest, or go to Suphan Trip photoset. This month's flight schedule was out a few days ago. I've got even more flights than last month ( which I thought was too many already!). I've been flying for 4 days from April 23rd to 26th, and another 2 days last Fri and Sat. Today's off. Then I'll start next month with 3 days of flights and a day of CBT, computer-based training. How's that? And since I was free today, I accepted Jack's invitation to join a one-day photo trip to Suphanburi. 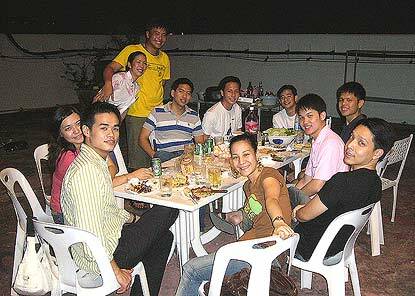 There were 4 of us; me, Jack, Jesse, and Ning. The weather was very nice, for taking photos, with few clouds and very strong sun (definitely not good for human beings though). We went to an old market, 100 years old, at Sam Chuk. Had lunch there, then moved to Bueng Chawak. Had dinner, then leave for Bangkok. 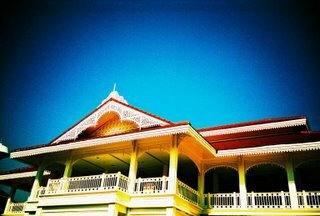 This morning I received an email from lomohomes that I just won lomohomes' Home of the Day. It was my first profile wall there consisting of pictures from the very first roll I took with my LC-A. Although a bit surprised cause that profile wall didn't even have a theme--I just put together some nice pictures from my first roll, that definitely sounded great. I got a lot of new guestbook entries from people I don't know and they all just congratulated. Thank you all. Pit talked about this new service Google Calendar earlier. Sounds nice, isn't it? Now I have an idea of sharing flight schedule of my classmates. Let's see if that would work. And I have to work during the holiday! Now I'm in Surat Thani, and tonight I'll be in Krabi. Also today is my sister Mod's birthday, so happy birthday to her too. Earlier, when I used my Visa card on a different currency, I always thought that the rate is calculated from the bank (financial institute) which issued the card itself. Well, the rate the bank charges you comes from Visa rate plus "foreign transaction fee" ranging from 0-5%. There is an exchange rate calculator at Visa which you can use to calculate approximate exchange rate for your transaction. Just got a new toy camera (again!). It's called fisheye camera. What's special about this camera is it can capture a really wide angle of up to 170 degrees. I've just uploaded my first roll taken with this camera at Flickr. Check it out! I took a few shots to see whether my new colorsplash flash really worked. Well, as you can see that's where I bought my flash. I had to exchange for another new one cause I didn't test it the first time. That really wasted my time. Anyway, I've got a working CF now, let's go lomo! I'm going to the general election today as I won't be in town next week. You can vote early on March 25-26 during 8am-5pm at district office. A few days earlier, I got a phone call from Khun Pocky at Nissan Krungthai. He was so kind that he gave me free tickets to Bangkok Int'l Motor Show '06. On Friday afternoon I had some free time so I visited the event at BITEC. I also thought about bringing my camera to take pictures of the "pretty" presenters at each booth. I used 2 rolls of slide films I'd bought earlier for my LOMO camera so I wouldn't have to buy new negative films. That idea turned out to be a disaster. I havn't touched this camera for so very long time that I just didn't remember its character and how to use it fluently. Fortunately I could get those 2 rolls of film scanned. The lab was so kind that they took time to pre-adjust the colors for me. I got home with the CD and adjusted/resized them a bit more , and then I finally got the finished result. (Thanks to digital technology!) Follow link above to see the pictures. Got one a few days ago. 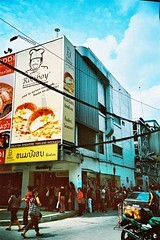 Yesterday I walked past the infamous Rotiboy bakery. There was a very long line of people waiting just to buy the bread. It's 25 Baht each and the store limits 10 pieces for person. Personally I think that's crazy. It's not that good and not worth it. And if that's not insane enough, later I saw a few teenagers carrying bags full of Rotiboy bread walking past me. And I noticed many people asked them whether they'd re-sell the bread. Yes, they actually were re-selling. How much would a bread cost, you might wonder? For half-hour queue the price went up to 55 Baht each! I just got back from Krabi last night when Jon called that Sally was gonna leave for her flight attendant training in Dubai. Yes, she will be flying for Emirates. And I thought I'd go say goodbye, well I was at the airport anyway. Unfortunately, by the time I got out of domestic terminal, she's already at the gate. So, I could only wish you luck, my lovely sister. Good luck and take care! This morning I was about to write a comment on my friend's blog and I was wondering which one of "วิญญาน" or "วิญญาณ" is the right spelling. Spent a few minutes browsing around Google search result for a dictionary, and to my surprise, the Royal Institute's dictionary is available on-line! How many people do you know give a damn about word spelling? .. Damn, I must be crazy! How are you guys? Having a good time? I've been away for a very long time, havn't I? Well I've been busy with these simulator classes, which are taking away all my time. And it's not over yet. There are 3 more sessions coming next week. After that, I'll fly one school flight (meaning: to fly a real airplane without passengers) and, if passed, get released for real route training (to fly real commercial flights with experienced flight instructors). Gotta go. Books are waiting..